캘리포니아밭쥐(Microtus californicus)는 물밭쥐의 일종으로 미국 캘리포니아주 대부분의 지역과 오리건주 남서부 일부 지역에서 서식한다. 캘리포니아목초지쥐로도 알려져 있다. 평균 몸길이는 172mm이지만, 아종에 따라서 크기는 아주 다양하다. 17종의 아종이 알려져 있으며, 일부 아종은 보호되고 있다. ↑ “Microtus californicus”. 《멸종 위기 종의 IUCN 적색 목록. 2008판》 (영어). 국제 자연 보전 연맹. 2008. 2009년 6월 11일에 확인함. Database entry includes a brief justification of why this species is of least concern. ↑ Cudworth, N.L. ; Koprowski, J.L. (2010). 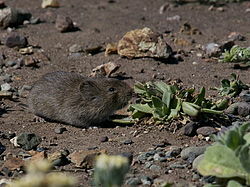 “Microtus californicus (Rodentia: Cricetidae)”. 《Mammalian Species》 42 (1): 230–243. doi:10.1644/868.1. 2017년 10월 22일에 원본 문서에서 보존된 문서. 2017년 4월 26일에 확인함. ↑ “CDFG Special Animals List, February 2008” (PDF). 2014년 8월 23일에 원본 문서 (PDF)에서 보존된 문서. 2017년 4월 26일에 확인함. 이 문서는 2019년 3월 13일 (수) 16:00에 마지막으로 편집되었습니다.